Scene 1: Knives are getting sharpened, day is getting to its end… a table is set with all necessary tools… lights are on! A soft music starts somewhere. Scene 2: Veggies and fruits are shaking, their end is near… Mss. Tomatoe is even sweating… Metal knives slowly move down, the light reflects in their shinny bodies and all of a sudden… a crime is committed!!! Scene 3: Lady Onion appears completely minced inside a bowl, Mss. Tomatoe (2) gets a clean cut and faints (seeds and peel are left away) and ends up in the same bowl cut in small pieces. Sir yolk egg gets whisked together with 1 table spoon of Mrs. Lemon juice and thrown into the bowl. Sra. Sal gets her space in the bowl too. They get all mixed and placed in the fridge. Scene 4: After one hour, Mr. Avocado (2) thinks he might escape but he sees a quick lighting and he passes away. His seed and peel are discarded and his meat is flattened with a fork and added to the fresh bowl. MORAL OF THE STORY: Veggies and fruits are too good and too healthy to have a long life! Let’s eat them!!! This is my entry for this month’s Click Event at Jugalbandi, the theme was METAL… first thing that came to my mind was a shinny knife… was Jack the Ripper one of my ancestors? If you are you craving for excellent food pictures, then go and see the pictures gallery at Jugalbandi’s!!! 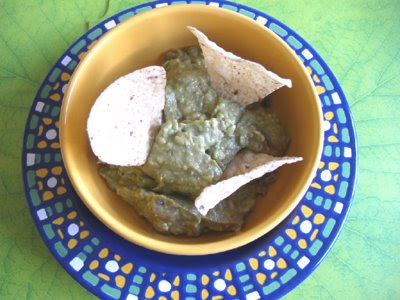 This recipe has been adapted from of Isabel Allende’s Guacamole recipe which was published in her book Afrodita. I think it’s her first non-noveled book; Afrodita was the goddess of Love and beauty in the Greek Mythology and the book is full of afrodisiac recipes from around the world. Concerning the guacamole sauce I made a minor change: I didn’t add 1 tea spoon of Worcestershire sauce. The recipe is original from Mexico but I guess that nowadays everybody knows about Guacamole and enjoys such delicious sauce. What a creative and clever post Nuria! I love the way you incorporated a story with the recipe! Good luck with click! Your post today made me smile from ear to ear Nuria. Guacamole is a favourite around here. Good luck in the Click event as well!!! Chica, guacamole is one of my favourite dips. The Mexicans will often add cumin too (which I like). Hola Chico! Since I discovered Guacamole is one of my favorites too, Peter! Thank you for your very gracious comment on our blog. Your blog is beautiful. Hi sweet lovely darling Nuria! How are you today? I just loved this post – so funny and entertaining and creative – just like you! I have never added egg to my guac before…I am gonna have to try it next time! Thanks for the tip! The bad thing about adding the yolk is that it should be eaten the same day. Have a great day, Starshine! you crack me up!!! that was a great read. thanks for the entry. Nuria, excellent post. Consider that you have won again. I loved your story and the picture with the knives is verrrrrrrrrrry good! Bravo! 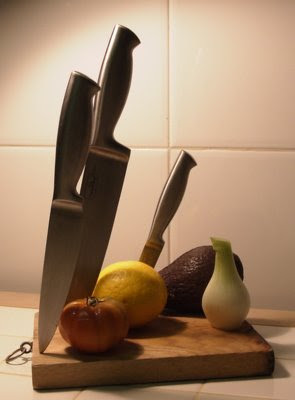 Great story – love the photo with all the knives ‘en point’! Great post, Nuria! So much fun. And what a wonderful event, too. Are you participating in the click event too? I’ll take a look at your blog. Your photograph with the knives looks like a carefully composed painting. I love the colors. Really nice photograph – Love it! You are so adorable! I think you could be on to something using veggies to create a scene! Very creative! As for guac, I must say, I have been known to polish off a whole bowl by myself and still run my fingers around the bottom to make sure I’ve gotten every last bit. But, guacamole can often be butchered! I once saw someone add a whole can of processed salsa to his guac and then stir it up till it looked like a glob of goo. But done simply, I think guacamole is one of the world’s most perfect food. I could polish off a big bowl of Guacamole with my fingers too! I can’t stop eating it!!!! Love guacamole and nice story and photo too, best of luck again with click!